Testing by an independent third party on a selection of AMD and Nvidia gaming class and workstation class graphics cards has found that AMD's drivers suffer fewer crashes while running the test suite, leading them to claim that AMD's drivers are more stable than Nvidia's. For most computer users, video driver crashes aren’t very common anymore. But sometimes your combination of hardware, software, and drivers can combine to cause a stream of seemingly unconnected malfunctions (or maybe it is just when the planets align?). It can be immensely frustrating when this happens. 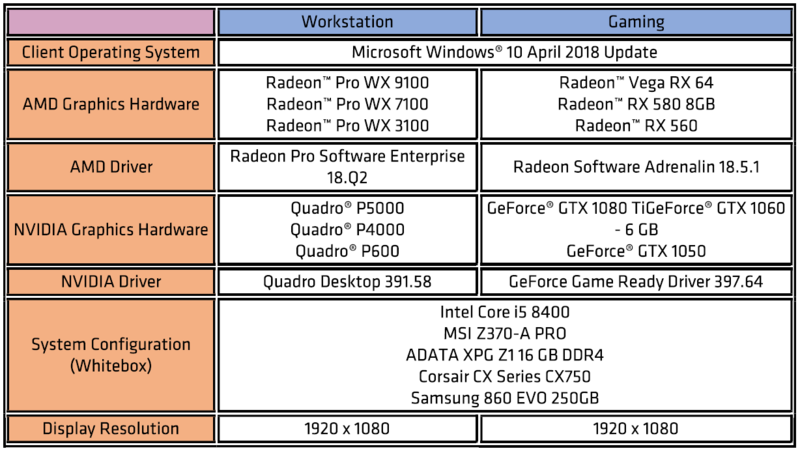 QA Consultants, an independent auditing company from Canada, has found in their testing that this scenario is less likely for AMD customers than Nvidia customers in 2018. AMD’s focus on improving driver stability and update cycle since the move from Catalyst Control Centre to AMD Crimson seems to be paying off. The results showed the AMD drivers passed 401 out of 432 (93 percent) of the tests, while Nvidia drivers passed 356 out of 432 (82 percent). The test was performed using three ‘gaming’ cards and three ‘workstation’ cards from both AMD and Nvidia, representing entry-level, mid-range, and high-end cards within each product category. 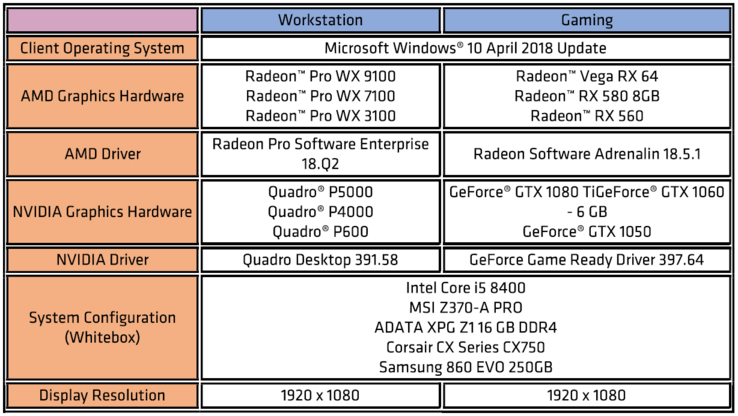 The operating system was Windows 10 1803, and the graphics drivers used were Radeon Software Adrenaline 18.5.1 (AMD gaming), Radeon Pro Software Enterprise 18.Q2 (AMD workstation), GeForce Game Ready Driver 397.64 (Nvidia gaming), and Quadro Desktop 391.58 (Nvidia workstation). Microsoft’s hardware lab kit was used for testing, running a 4-hour “CRASH” test that uses functions of DirectX 9, 10, and 11 that could cause the driver to hang. The tests ran continuously for 12 days for a total of 72 runs per card. If a pass caused a program or driver to crash, or caused the operating system to blue screen, then that pass was considered a fail. We saw in the fine print that AMD commissioned (and therefore paid) QA Consultants to perform the test. This isn’t noteworthy by itself since it is usual to commission testing and using an independent third party should reduce any potential bias. However, while looking for more information on the report, we came across an article by Legit Reviews where they detail how AMD chose and provided all 12 GPUs. They noted that in the full report it shows that while both manufacturers had higher driver failure rates on workstation cards, the Nvidia GTX 1060 had a disproportionately high failure rate among gaming cards. This means that AMD’s card selection could have influenced the results. Nobody outside of AMD can know the answer since only they would know if they pre-vetted cards or not.